Horse racing betting for PICK 3, PICK 4 and PICK 6 wagering at any racetrack can get quite expensive. Horse players are bombarded with wager selections and "winning methods" of making picks. But in the end its you at the betting window making your final picks and knowing (or not knowing) on how to make these wagers. Many players jump from one type of exotic pick to the next, almost always contradicting from one betting ticket to the next. Many bettors come across different challenges and potentially lose out on greater profits by not having a good understanding of how some wagers really work. My Partwheeling betting guide is just a small example of "How To Bet" and how to improve your chances of winning at the racetrack. Horse racing betting for the avid horse player is essentially a flurry of exacta and triple wagering. The WPS is very common and often used as well however I want to get into the EXOTICS of wagering on this page. Pick 3, Pick 4 and Pick 6 wagering gives you a multitude of horses to choose from. However picking 3 consecutive winners of three consecutive races may be rather difficult. I want to show you a basic exotic wager where you can improve your chances of winning at the races. Have you noticed how Pick 3, 4 or 6 results may pay thousands of dollars and are usually hit by more than one person? Do you think an individual wagered 2 bucks on 3 individual horses or 6 individual horses in order to win? Not quite, although it does happen, but chances are an exotic wager was placed and a pool of horses was covered by the bettor. A betting strategy for multirace betting is very simple to understand but the key factor is getting it right at the betting window. Basically what you have here is a simple EXOTIC wager for playing the PICK 3 at any racetrack. 1,2,3 WITH 3,4 WITH 5,6,7,8. As you can see with exotic wagering horse racing betting can get geometric with life changing results. EXOTIC wagers can also be applied to Harness Racing and "Harness racing systems" alike. You don't have to be an expert at every type of race i.e. sprint, turf, etc. in order to succeed at these wagers. Being a handicapper gives you an advantage of many opponents who will be "stabbing or guessing" in at least one or two legs of a multirace wager. The PICK 4 wager is just as simple as the PICK 3...we are simply adding one more leg to the wager. This exotic betting strategy would cost you (3 x 2 x 4 x 2) = $48.00 and you would cover three horses in the first leg, two horses in the second leg, four horses in the third leg and two horses in the fourth leg. This horse racing betting strategy has landed many PICK 4 winning tickets for me and many other handicapper's alike. Horse racing betting can go a step further into the PICK 6 wager by just adding two more races (legs) and continue your improved chances of winning. However the PICK 6 cost will increase (or decrease) depending on how many horses you include in each leg. A good hedge is to have one or two singles in the mix for your PICK 6 wager so you can add three to four horses in one or two of the other legs. For example.. Your PICK 6 cost (3x2x1x2x1x3) = $48.00 for a one dollar bet. Some tracks only except a two dollar minimum wager for the PICK 6 which would make this a $96.00 wager. Carryover's into the hundreds of thousands may warrant a $96.00 investment. Each of us have a different bankroll to invest. Horse racing betting systems for multirace wagering is your Best Bet for improving your chances of winning. SINGLE BET = 7 with 5 with 3 easy pick 3 straight bet. Now do this = 7 with 1,3,5 with 2,3,4 Partwheel bet. Now do this = 6,7,9 with 5 with 2,3,4 Partwheel bet. Now do this = 6,7,9 with 1,3,5 with 3 Partwheel bet. Whereas the 7 , 5 , and 3 are your key horses. If each key horse wins you would win all four PICK 3 bets. Re-read these cover bets over again and notice the multiple win factor. It's important to realize your total wager against your potential return. You would not want to "overbet" your pick 3 for a low return and you would not want to place four pick 3 wagers where you can win only one of them and lose on the other three. Remember when horse racing betting is concerned you need to COVER YOUR BETS, MANAGE YOUR BANKROLL and most importantly BE DISCIPLINED when playing horse racing systems at the betting window. 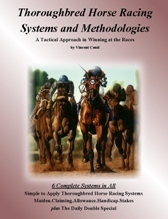 I've included two free horse racing systems on this website for your viewing pleasure.